The air is crisp; the nights are cool. Your fireplace should be cleaned every 40 or 50 fires, or after burning the equivalent of four cords of wood. What better way to complete the cozy picture than to build a roaring fire in the hearth? 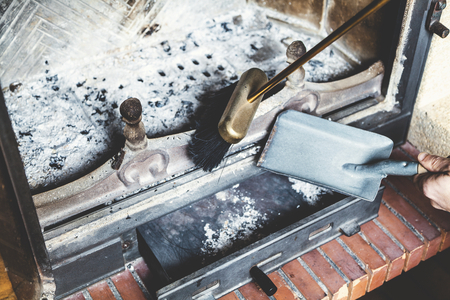 If you haven't given your fireplace a thought - or a cleaning - since last winter, now is the perfect time to come clean. Chimney sweeps recommend a professional cleaning every 40 or 50 fires, or after burning the equivalent of four cords of wood. But there are a few things you can do yourself before you fire up the first blaze in the hearth. These 8 fireplace maintenance tips can help get you started. Start fireplace troubleshooting by opening the damper. Grab a flashlight and see whether anything is blocking the chimney. Animals sometimes take up residence in the warm confines of a chimney left idle for months. 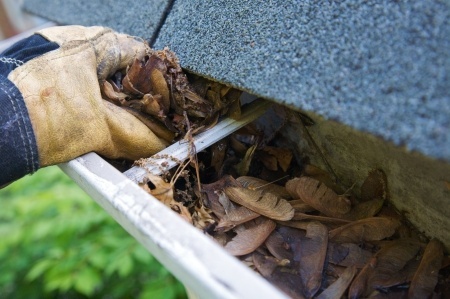 Falling leaves also tend to build up in the chimney. If you see a blockage, call to arrange a professional chimney inspection and cleaning. Clean the firebox of any ashes, dirt, or debris that might have accumulated during months of nonuse. This simple fireplace maintenance task will remove any detritus that could prove a fire hazard. The dirtiest byproduct of fireplaces, however, is the dirty air they can create in your home. What's the best way to keep the air cleaner and healthier after you light your fire? Start by rethinking your hearth habits. That warm fire crackling in the hearth can create smoke with such scary air pollutants as carbon monoxide, hydrocarbons, nitrogen oxides and volatile organic compounds. These toxins can adversely affect anyone in your home with a breathing problem, especially children with asthma and senior citizens. The cleanest choice for both the hearth and the air is to switch from a wood-burning fireplace to a gas fireplace. There are new models that look as though they're burning real firewood. Some self-contained units can even fit into existing masonry fireplaces. Wood-burning fireplace Inserts certified by the EPA are also available in sizes and styles that can fit into an existing masonry fireplace. The fire is visible through the screen with excellent heat output and very little smoke. For those who eschew the gas-fueled fireplace, composition logs such as Duraflame are the way to go to reduce indoor air pollution. They produce up to 50 percent less smoke and pollutants than wood. And if you're a purist who simply cannot fathom fall without the earthy aroma of a roaring wood fire? Well, at least learn to light it the most effective way possible to minimize everyone's smoke exposure. 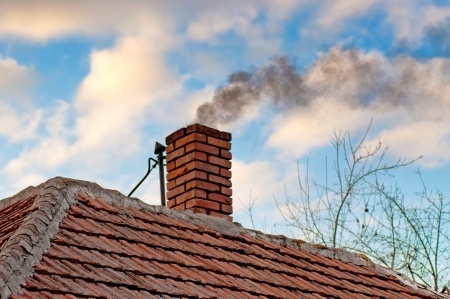 There are several easy ways to minimize wood smoke. Start by choosing the right kind of wood. Dry wood burns more efficiently and causes less smoke. Firewood should be dry, or seasoned, six to 12 months after splitting. Hardwoods, such as oak and orchard, dry slower than softwoods such as pine and fir; some make take a year or more to dry. To speed the drying time of logs, split big logs and stack firewood crosswise to allow the air to circulate freely. Store firewood a foot or more aboveground, away from buildings and in a sunny, well-ventilated area. Cover the top to keep dew and rain off the wood, but leave the sides open to breezes. To make sure the wood is dry, clap two pieces together. You should hear a crack sound, like a bat hitting a ball, not a dull thud, which means the wood is wet. Anything visibly green isn't ready for burning. Make sure you don't burn anything other than clean, seasoned wood, manufactured logs and non glossy white paper in your home. Garbage, plastics, rubber, painted or treated wood, particle board, plywood, coal, charcoal briquets and colored paper produce toxic gases that can harm your lungs and clog your flue. Send them out for recycling or garbage collection. When you're ready to burn, open the damper wide and start a small, hot fire. Crumple a few sheets of newspaper and some small pieces of softwood kindling, such as pine or fir, then light. Add bigger kindling a few pieces at a time as the fire grows. Once the fire is burning briskly, add two or three hardwood logs, such as oak, placed close enough together to keep each other hot, but with enough room for oxygen to circulate. The idea is to create a small, hot fire first, which keeps the dirty smoke to a minimum. So, how do you know if you're burning clean? Where there's black smoke there's a bad fire. Where there's smoke, there's a bad fire. Excess smoke is a good sign that your fire wasn't lit properly or isn't burning correctly. Get in the habit of walking outside your home and glancing up at your chimney about a half-hour after lighting a fire. A good fire will give off only a thin wisp of white steam. If you see smoke, adjust your dampers or air inlets to let in more air. The darker the smoke, the more pollutants it contains, and the more fuel being wasted. Now, you can settle back, relax, and enjoy your clean, safely burning fireplace.